firmer and hoppier than the average wheat ale. It is fresh but smooth too and it has a refreshing, soft bitterness to it. Bottle 500ml. @ The Shnoodlepip, London. [ As Thornbridge / 't IJ American Wheat Ale ]. Pours golden, a lot of sparkling but little white top. Aroma of flowers and some spices, some yeast aroma as well. Taste is very carbonated, but fresh. At the same time, low bodied, with a pronounced acid aftertaste. A nice beer. Bottle sample at a tasting at Tom L’s place. Thanks troubles. Yellow. Nice fruity hops aroma, juicy, tropical. Dry flavor with a bit of wheat, and nice moderately bitter fruity hops. Quite light-bodied. Good and refreshing. 50cl bottle from Westholme Stores, Goring. 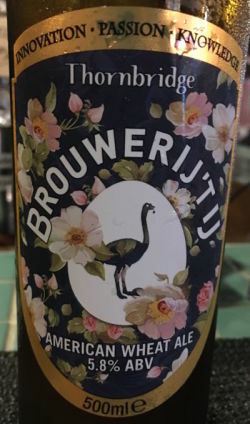 A pale amber pour with a ring of white head; fresh floral/herbal aroma; smooth and full bodied, with a fresh, honeyed, wheaty body with a herbal bitterness; and a long gentle bitter finish with a touch of warmth. Excellent. Clear golden, lager-like color. Small head, medium to high carbonisation, no lacing at all. Hoppy and fruity aroma of lemon, white wine/champagne, wheat, lemon grass and elderflower with floral/pine notes. Taste is hoppy and grainy, which descends into slightly bitter and dry finish. Notable sweet and sour hints in it. Refreshing and enjoyable easy-to-drink wheat ale.